Description: New Fender Passport with 25 watts of clear stereo sound. Comes with 2 microphones and cables and 2 speaker cables. Also 2 speaker stands with carrying case are included. 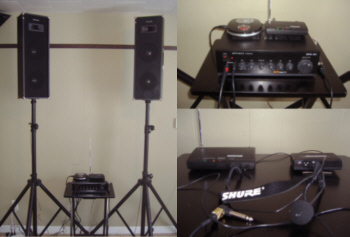 Cordless microphone, 2 speakers with stands, all cables - 150 watts. Shows some wear wear but in good working condition. Duel CD Player with Two Channel Mixing & Mic Capability.